The world's first laptop with twin monitors is slated to hit the stores by the end of the year. 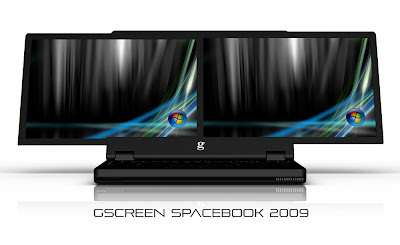 The dual-screen laptop, entitled Spacebook, was masterminded by Alaska-based technology firm gScreen. The pioneering technology, that will let users to multi-task while on the move, will have two 15.4 in screens, reports the Telegraph. The PC is estimated to cost enthusiasts around 3,000 dollars but not without concerns regarding the weight of the Spacebook and the pressure on the batteries to meet the energy demands of running two screens. Gordon Stewart, the founder of gScreen, told US technology website Gizmodo, that the gadget could be expected to be up for grabs on Amazon by December this year, provided final modifications had been dealt with. He said: "We designed this knowing that many may not need the extra screen at all times." Spacebook is thought to be the first of its kind with twin screens of equal size. 100% North American Sales and Tech support for all gScreen laptop computers. The gScreen Spacebook is the first dual screen laptop with two 15.4-inch identical screens and a full-size keyboard, built into one laptop unit. It's just a 1 more trap to use, u r and waste your mind on these stuffs. I think this is a great idea. dual screens are sometimes necessary. I use Protools for music production, and 2 screens are an amazing help. anyone who requires multiple windows to stay open are in need of this device. as long as the durability is sufficient, and the harddrive has a sugnificant amount of space, i am happy. this can be the one thing that determines whether some people go with a Mac or pay a little less and have total control!